For decades now, Hans-Jürgen Reichelt, his wife Edda & their daughter Rebecca, have been impassioned admirers and collectors of Thangkas, those fascinating works of Lamaistic art, probably the most beautiful religious art on earth. As far back as the early 1970s, Hans-Jürgen Reichelt began to travel extensively throughout Asia, including Nepal, from where he brought back his very first Thangkas. This sparked the beginning of his life-long passion as a Thangka collector. Hans-Jürgen's new bride, Edda, soon shared his contagious enthusiasm and their daughter simply grew up in this tradition.. 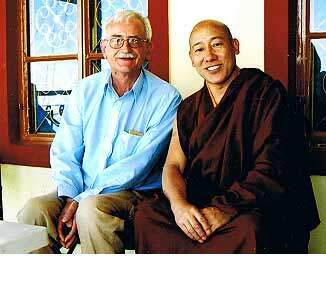 Even as a small child, Hans-Jurgen had felt a strong affinity toward Tibet and its religious and political leader, the Dalai Lama. For years he dreamed of one day being able to attend an audience with His Holiness. 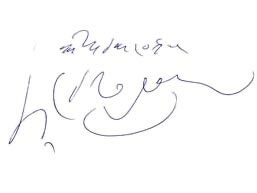 In 1993 an article appeared in a regional newspaper published in Bremen, Germany, entitled: "Audience with the Dalai Lama is His Dearest Wish". Eventually his wish did, indeed, come true. 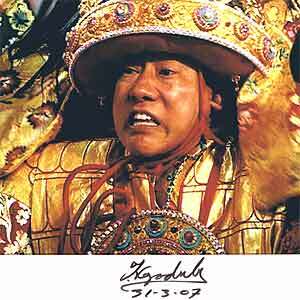 In May 1998 he and a number of friends were granted a private audience with His Holiness, the 14th Dalai Lama. A few days prior to this audience, he had been the guest of the Kuten, Ven. 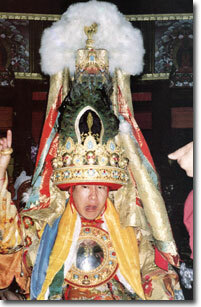 Thubten Ngodub, the Medium of the Nechung Oracle, the State Oracle of Tibet, who is also Abbot of the Nechung Dorje Drayangling Monastery. The Kuten und Hans-J. Reichelt in the Nechung Monastery. Photo with personal dedication. 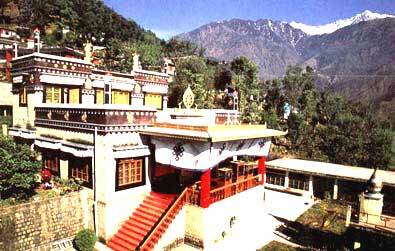 Nechung Monastery to a Tandoori Chicken dinner in a restaurant in Lower Dharamsala. His Holiness, the 17th Gyalwa Karmapa, Orgyen Thinley Dorjee. 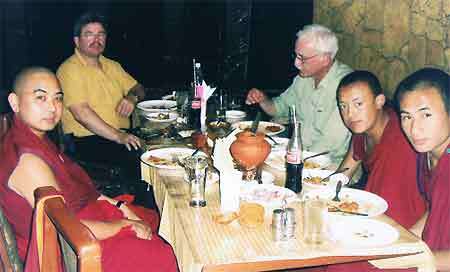 Both before and after this, his travels frequently led him to Dharamsala, where he made friends with Tibetans living there, among them a former long-time member of the Tibetan Exile Parlament, Norbu Dharguay. 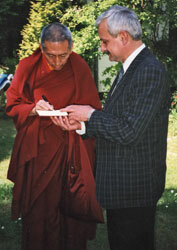 During a visit to Germany, Norbu-La recorded the text of the Tibetan greeting at this website. 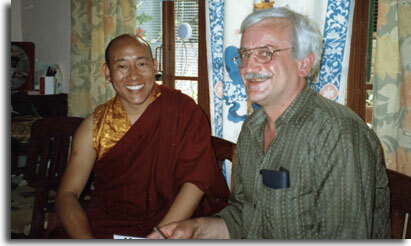 As early as 1994, during a conference in Hanover, Germany, Hans-J. 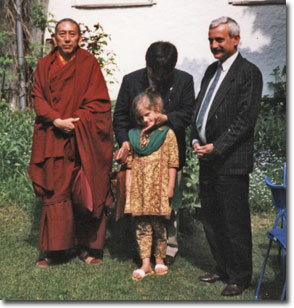 Reichelt and his daughter, Rebecca, met Prof. Dr. Samdhong Rinpoche, then president of the Tibetan exile parliament, former prime minister of the Tibetan exile government. Subsequently, many more dreams came true. Hans-Jürgen Reichelt continued to frequently be granted the opportunity to meet with wonderful people from the cultural sphere which gave rise to this splendid religious art. 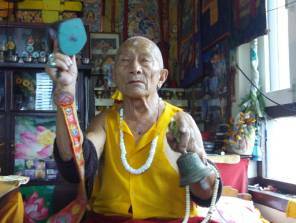 Over the years he has also met numerous times with a well-known Tibetan Oracle Medium in Nepal in order to request his mediation in acquiring answers and advice on certain matters from the Spirit of the Oracle. very near the residence of the Dalai Lama. received from the Kuten while he was in a state of trance. One day later, he had an appointment with Chhime R. Chhoekyapa, the private secretary of His Holiness, the Dalai Lama, to seek permission to present His Holiness with a very special Thangka. His request was granted. 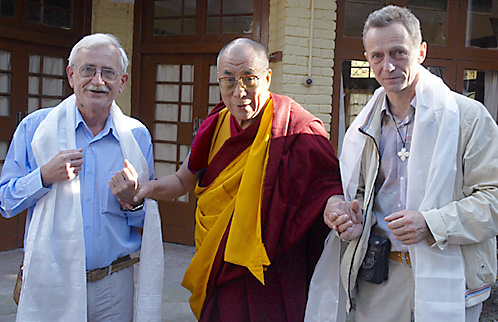 On October 3, 2007, after the exquisitely executed Thangka depicting Buddha Amitabha & Paradise Sukhavati had undergone a thorough inspection by the Kuten and other monks, Hans-Jürgen Reichelt had the honor of personally presenting it to His Holiness, the Dalai Lama, in Dharamsala! 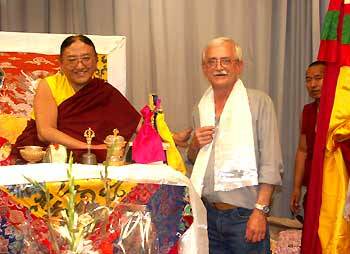 In June 2007, a Vajrakilaya dedication was carried out by His Holiness, Sakya Trizin in Lahr (Southern Germany), to which Hans-J. was invited to bring his Thangkas. He was also asked to decorate the town hall, in which the dedication took place, with Thangkas from the Snow-Lion collection and also had the honour of being able to personally meet with His Holiness. A short while later, a Kalachakra dedication was held in Florence (Firenze), Italy, again with His Holiness, Sakya Trizin. Here, too, Hans-J. was invited by the organizers to bring his Thangkas. In addition, he was requested to provide a number of statues from the Snowlion collection to embellish the "sanctuary" set up in the SASCHALL Theatre in Florence. In addition, the organizers purchased a splendid Sakya Thangka from Reichelt, which was then presented as a gift to His Holiness. Unfortunately, photos of this Thangka no longer exist and therefore cannot be shown here. The Snow Lion Gallery has already carried out a great number of Thangka exhibitions, many of them in Germany, e.g. in adult education institutions, Buddhist centres, galleries, city halls, civic centers, art and cultural societies, and museums. On the occasion of the opening of The World's Fair, EXPO 2000 in Hannover, Germany, such an exhibition took place in the Vien-Giac monastery pagoda, then an official EXPO 2000 off-site exhibition centre. Over the years, further exhibitions have been organized in Holland (Hardenberg), Switzerland (Zurich), Italy (Florence) and in the United States (Walton, New York). 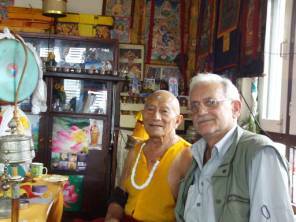 In this way, the Reichelt family has been living all these years not on, but with the splendid art of Tibetan Buddhism. We most definitely doubt we would ever be able to live without it and rather choose to share our delight in and appreciation of this uniquely aesthetic art form and its spiritual power! Home presentations have long been, and continue to be a frequent mode of introducing people of all walks of life to these fascinating works of art. Hans-J. Reichelt is a sustaining member of the Gesellschaft für Indo-Asiatische Kunst Berlin E.V. www.giak.org, (Society for Indo-Asiatic Art in Berlin); and a member of Ratna Tara Mission e.V. Haren, an association dedicated to providing exile Tibetans with aid and support. The proceeds of sales are used by Snow Lion to fund sponsorships for several Tibetan monks in exile. Further support is granted needy exile Tibetan men and women and needy Nepalese families, who otherwise would have no income. We financed secondary education for a young Nepalese student, for whom we are currently providing the means for his university studies. 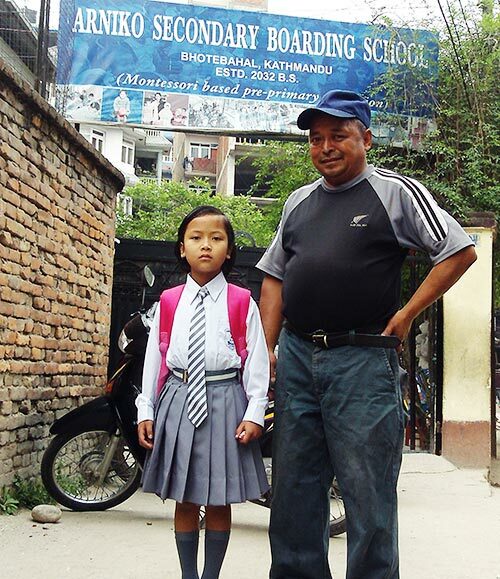 The same type of educational aid had previously been provided a young Nepalese woman. We are currently providing the means for a little girl to attend a private school, as, otherwise, for lack of money, she would have to attend a public school (at which not much can be learned and harsh corporal punishment is far too common). Her father, a single parent, is only sporadically employed on a part time basis (see photo below). We support rikshaw drivers, who have families with at least 2 children to feed, by providing them with rikshaws of their own. 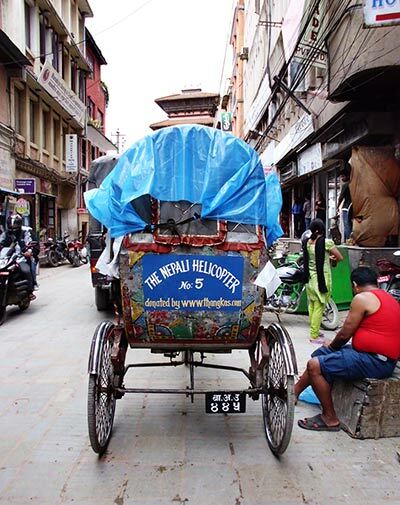 You can recognize these in Kathmandu by the large blue sign with white lettering on the back: "The Nepali Helicopter Nr. 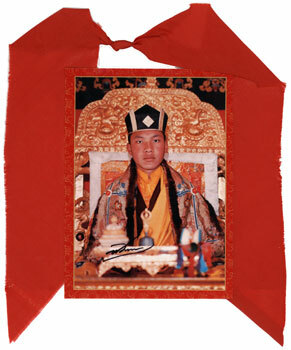 xy, donated by www.thangkas.com". In this way they need not pay daily rental fees for their rikshaws and are property owners, which opens better opportunities for them to provide for their families. 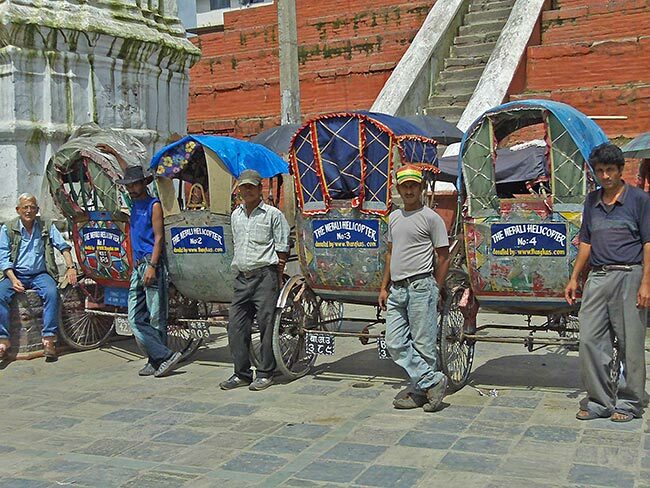 At present four of such rikshaws are running in Kathmandu. See photos below. 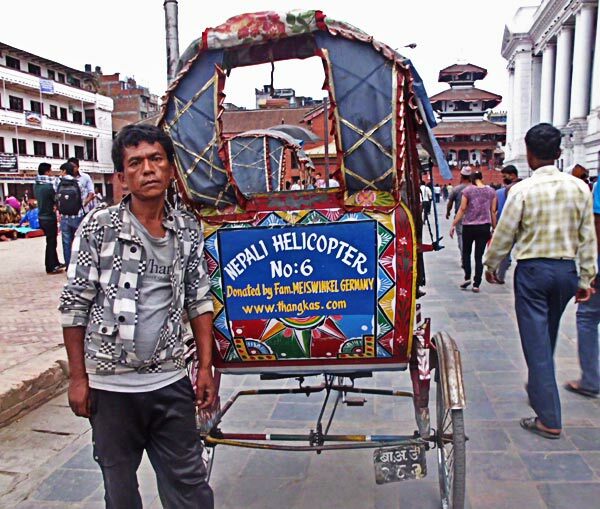 Since July 2012 goes "Nepali Helicopter No. 5" through the streets of Kathmandu. 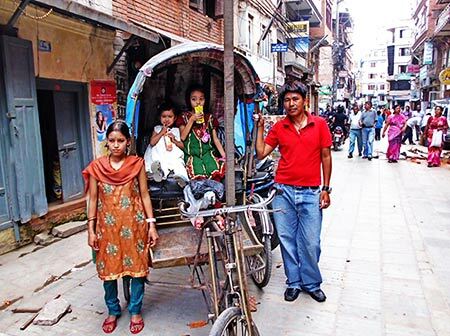 This new Rikshaw driver also has to feed a family with 2 children (see 2 photos). "Pilot" No. 5 with family and Rikshaw in the famous "Freak Street"
Thanks to sponsorship of the family Meiswinkel from Kuppenheim, Germany (www.anvaya.de), "Nepali Helicopter" No. 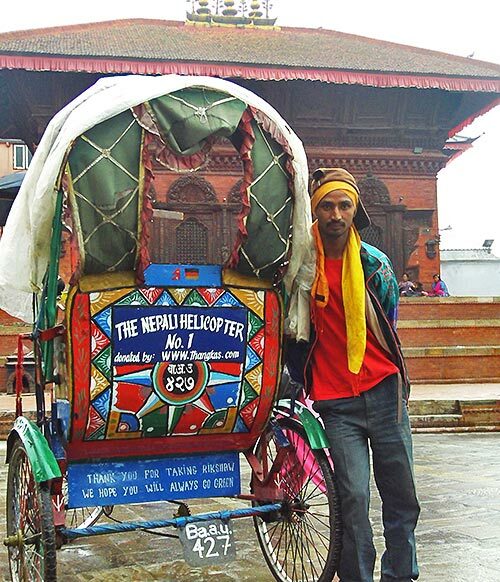 6 already runs since May 2013 through Kathmandu. 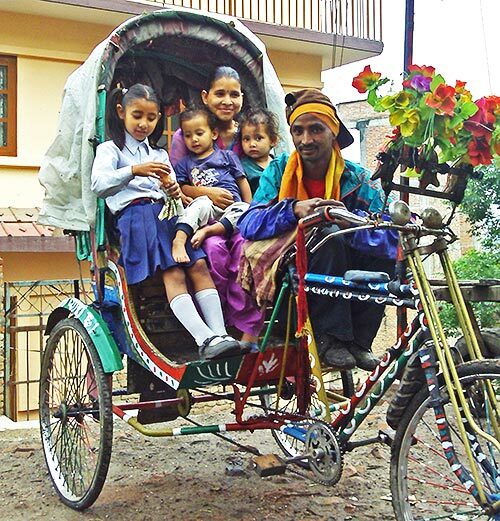 The driver nourishes a 5-headed family with the Rikshaw. Now also he doesnt need to pay any more daily rent for his Rikshaw. 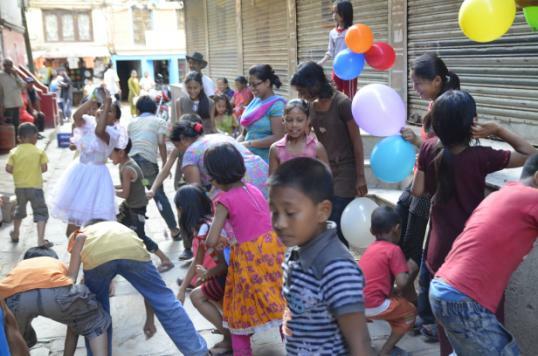 At irregular intervals we plan and carry out frequent public children´s festivals in Kathmandu, as well as for children of the Taru people in Chitwan National Park. 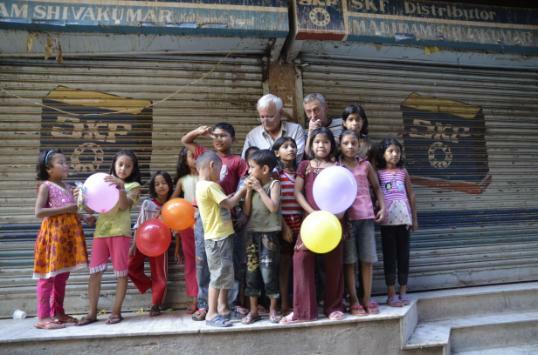 From time to time, we provide aid and support for a combined children's home and safe house for abused women in Nepal. We number among the major clients of several Thangka artists, thus assuring them a reliable income.